This July was the wettest July in my twelve years as bird recorder. While April and May this year had been dry, the cooler, wetter theme of June continued into July. 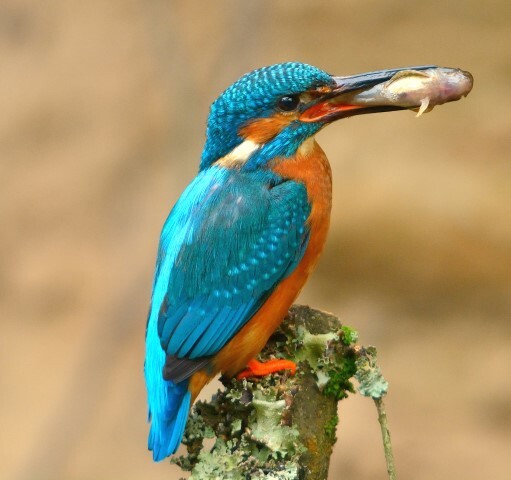 The highest temperature this July was six degrees lower than last July, and with a third more rain than last year, this July was not conducive to the successful breeding of some of our avian summer visitors like the hirundines which rely on flying insects to raise their young. The number of young Swallows and young House Martins reported has been fewer than last year. With numbers of hirundines still around including eighty Swallow at Sliddery on 23rd, one hundred Sand Martin at Sannox on 25th and thirty House Martin at Balmichael, perhaps later broods will be more successful. By contrast seed eating species seemed to have had a successful breeding season, with for example widespread reports of young House Sparrow, Chaffinch, Goldfinch and Siskin in gardens. 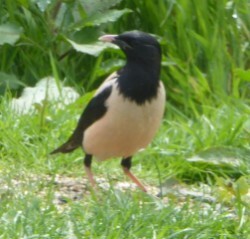 Other signs of a successful breeding season included: a young Great Spotted Woodpecker in a garden in Brodick on 3rd, young Fulmar at Cnoc Buidhe on 7th, seven young Shelduck on Cleats Shore on 11th, two young Mute Swan at Catacol on 17th, forty Black Guillemot on Pladda on 18th, three young Spotted Flycatcher in Lochranza on 22nd, one hundred and sixty-nine Jackdaw at Drumadoon on 24th, sixteen Eider at Machriewaterfoot on 24th and three young Hen Harrier at Torr Righ Mor on 25th. 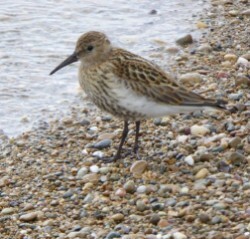 A number of northern breeding species heading south from their breeding grounds, many still in their breeding plumage, were reported including: a Greenshank on Sliddery Shore on 5th, an Arctic Tern in Brodick Bay on 17th, seventeen Redshank in Sandbraes also on 17th, four Dunlin, ninety-two Golden Plover and twelve Turnstone at Machriewaterfoot on 24th and three Sanderling, two Whimbrel and three White Wagtail on Sliddery Shore on 26th. Over one hundred species were reported in July. Other highlights included: Grasshopper Warbler reeling in the dark at Bennecarrigan on 1st, Moorhen on Mossend Pond on 11th, Garden Warbler at Corriecravie on 12th, five Little Grebe on Mossend Pond on 13th, five hundred Manx Shearwater in Whiting Bay also on 13th, three Swift over High Kildonan on 17th, six Water Rail in Corriecravie on 23rd, a Black-throated Diver in Catacol Bay on 24th and a Tree Pipit at Cnoc an Fheidh on 29th. Finally in the June Bird Notes I wrote “Cuckoos, whose decreasing numbers are a cause for concern nationally, seem to be thriving on Arran. Throughout May and June there have been many widespread reports. People need no prompting to report the first Cuckoo. How about reporting when you hear or see the last Cuckoo this year?” My thanks go to those of you who have responded. By now the adults will have left the UK leaving the young to be brought up by their foster parents. 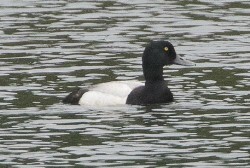 The young have a distinctive white spot on the nape of the neck. The latest date that I have had so far for a young Cuckoo is one at Corricravie on 20 July. 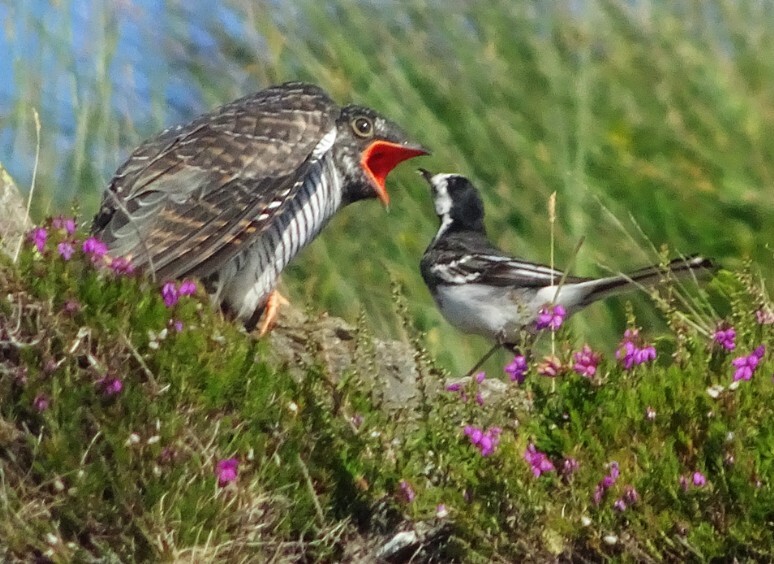 The photograph of the young Cuckoo being fed by the Pied Wagtail was taken at the Fairy Dell on 18 July.